If you’ve been following along on Twitter this week, you probably know I’ve had a major PC problem. I had some files backed up, but fortunately I was able to back everything up yesterday. So I haven’t lost any of the data I spend much of my time working on as a career and hobby. I’ll have a better PC this week, but for now I’m going to be brief on this week’s preview. Week 7 has a real solid schedule, but obviously the highlight game is SNF: 49ers at Broncos. Out of the 64 AFC-NFC matchups this year, this is one of the most likely to be a rematch in February. These teams have been among the best the past few years and this should be a competitive one, prime-time blowouts be damned. 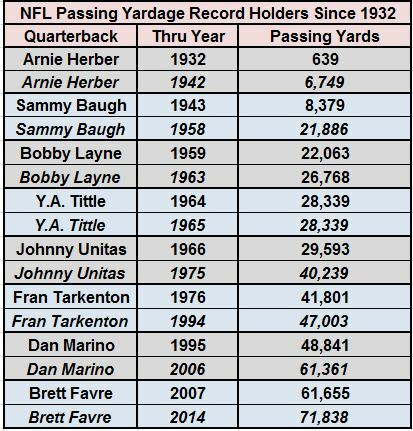 There’s also some major NFL history at stake with Peyton Manning needing three touchdown passes to surpass Brett Favre (508). Why is it major? There aren’t many more satisfying plays for a quarterback than to throw a touchdown pass. Throw a bunch of them and you’re going to have plenty of highlights and wins. 11/20/1995 – Dan Marino tied Tarkenton at 242. 9/23/2007 – Brett Favre tied Marino at 420. 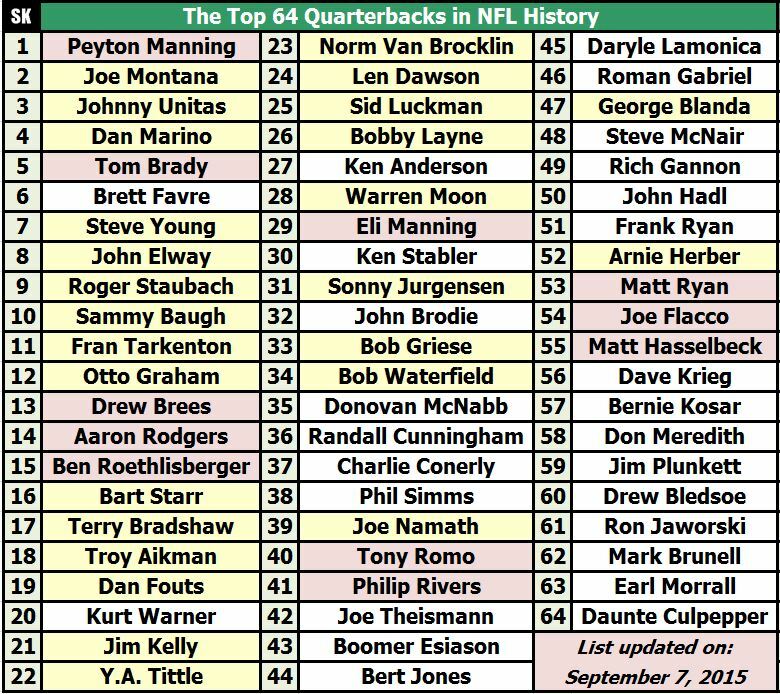 Manning will be only the 8th quarterback in the post-WWII era to hold the record. With his finish to be determined, Drew Brees and Andrew Luck may be the only active players with a realistic shot to catch Manning some day. The table is easy to read and only includes regular-season touchdown passes. Peyton has thrown 111 touchdowns that gained at least 30 yards, the most of any quarterback ever. If Manning’s next TD pass is at least 34 yards, he’ll break seven ties in the 2-34 range. He has a good shot to retire with his name in first on 1-40 yards. He also needs one 70+ TD pass to break that tie with Favre, but those are very rare. Manning has 24 games with Denver with 3+ TD passes, so I think he’ll get it over with on Sunday night. Of course I had the Patriots on TNF, but that was much closer than expected. Road teams ruled last week, but I like many of the home teams this week (but not the homers that come with them). NFL Week 5 Predictions: End of an Era? Nothing fancy to write about today. I’m just hoping for a few prime-time games that aren’t total bloodbaths. Seahawks-Redskins gives me little hope on Monday — Richard Sherman pick-six alert — but the Bengals-Patriots is most interesting given the first four weeks of this season. In any other year I would guaran-damn-tee a New England win. Forget that the Bengals are 3-0, playing very well and coming off a bye week. This is New England. This team doesn’t lose two in a row and they almost never lose at home. However, is this still that New England? It really hasn’t looked that way so far. Every run eventually ends. If the Patriots lose in ugly fashion at home to the Bengals, we might be looking at the end of an era. Then again, the AFC East, which has mostly stockpiled wins over Oakland, is so dreadful the Patriots may still end up with a home playoff game out of this. The NFL schedule makers probably never imagined Week 5 would feature the only undefeated teams, Arizona and Cincinnati, would be on the road to face Peyton and Brady. Given past history, you expect we won’t have a 4-0 team for only the second time since 1990 (last time: 2010). I can trust Manning to have a strong game off the bye, and for Von Miller and DeMarcus Ware to give the mad-bombing Drew Stanton fits. I like Denver this week. I usually trust the New England winning machine, but what has this team shown this year to make us really think they should win this game? Sure, the Bengals usually disappoint in any big spot, but when one era ends, another usually begins. The Bengals could use this win as much as the Patriots to change longstanding perception. Closer to our chosen paths. I had the Packers winning big, so for once I would have made a good TNF bet against the spread. Yes, I picked against the Patriots. My apologies, Cincinnati. I’m not here to shovel dirt on Tom Brady’s career today. Technically, everyone’s career is closer to death with each passing day, but the boldness of declaring Brady finished is something I would need far more evidence to dare write. However, let’s evaluate some troubling numbers. Just passing for 200 yards and/or multiple touchdowns has become a struggle for Brady dating back to late last season. Brady hasn’t thrown multiple touchdown passes in his last seven games — one shy of the longest streak of his career (came in 2001). In each of his last eight games, Brady has been held under 8.0 yards per pass attempt, one of the longest streaks in his career. The lowly Oakland defense held him to 6.32 YPA at home last week. For the second year in a row the Patriots have gotten off to a slow start offensively, but this year isn’t about a massive turnover at receiver. Julian Edelman is impossible to cover underneath and he’s caught 22 out of 28 targets. Rob Gronkowski is back, though he’s been limited in his recovery from a torn ACL. Danny Amendola is there, but he’s not been the success the Patriots gambled on when deciding to move on from Wes Welker. Then there are the outside wide receivers that tend to occupy milk cartons in this offense. Brandon LaFell has caught 4-of-14 targets from Brady. Kenbrell Thompkins has 53 yards on 11 targets. Aaron Dobson has barely seen the field with injuries. This year’s new problem is the offensive line. Subtract Logan Mankins, and more importantly, subtract OL coach Dante Scarnecchia, and without that pristine pass protection or consistent run blocking, you get an offense that ranks last in the league in yards per play (4.3). Yes, even below the Jaguars (4.6). Some of the problems are new, but some have been there for Brady’s entire career. They’ve just been masked better by superior coaching and talent. Brady’s not a scrambler. He’s not one for extending plays. He won’t break out of sacks. He’s not a great vertical passer able to stretch the field on any given play. He’ll dink-and-dunk a defense to death, only to set up a big play at the opportune moment. And at 2-1, the Patriots are still technically winning, even if it’s all about a defense that’s allowed a total of 16 points to Minnesota and Oakland the last two weeks. Some of these players had rushing value you don’t get with Brady, but dominant defense was also a common theme here. If you lowered the bar to 6.0 YPA (minimum 30 games), Brady again has the best record ever at 27-20 (.547) when including playoffs. That’s more than a full yard per attempt below the league average. Only five quarterbacks since 1960 have a winning record in that situation (McMahon, Stewart, Len Dawson, and Jim Kelly) with a minimum 30 games. 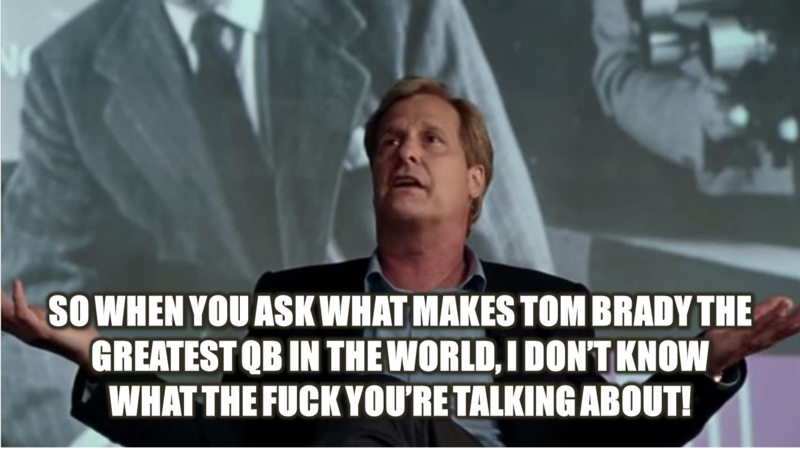 Does that make Brady special? Not really, but it does say a lot for Bill Belichick and the Patriots. They find different ways to win, but if Brady’s playing like this against competition like Miami/Minnesota/Oakland, then how can the Patriots expect to win a championship this year? I had another theory about Brady’s winning record with bad YPA. Not all sub-6.0 YPA games are created equally. Maybe Brady does other things well on those days, such as a higher completion percentage and good touchdown-interception ratio. 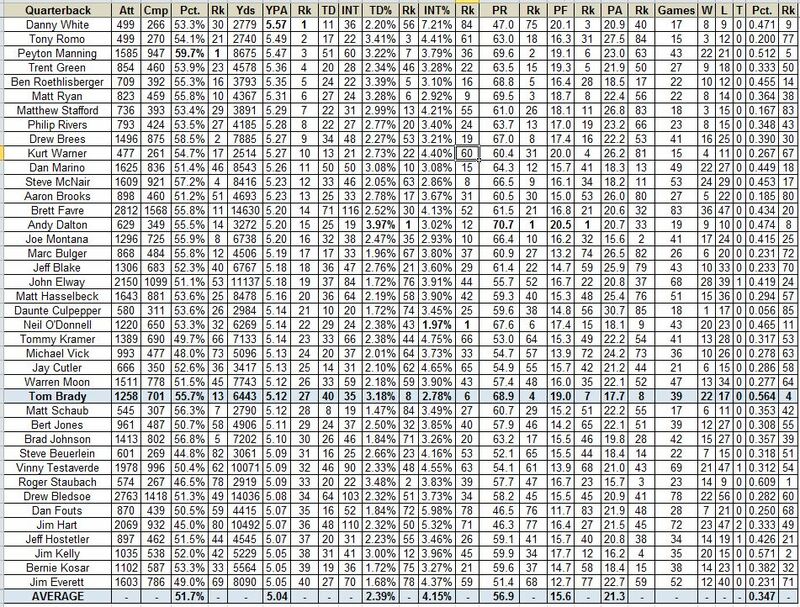 So I looked at my growing database of QB game logs (regular season only) and looked at every game (min. 10 attempts) thru 2013 where the QB averaged no better than 6.0 YPA. Then I summed those numbers together to produce the following table (click to enlarge). It’s not a conclusive list — I have about 90 players and many of them are very good — but it gives us an idea of general performance. Using 85 quarterbacks with a minimum of 400 attempts, I ranked everyone best-to-worst on sub-6.0 days for stats like completion percentage, YPA, TD%, INT%, passer rating (PR) and win pct. 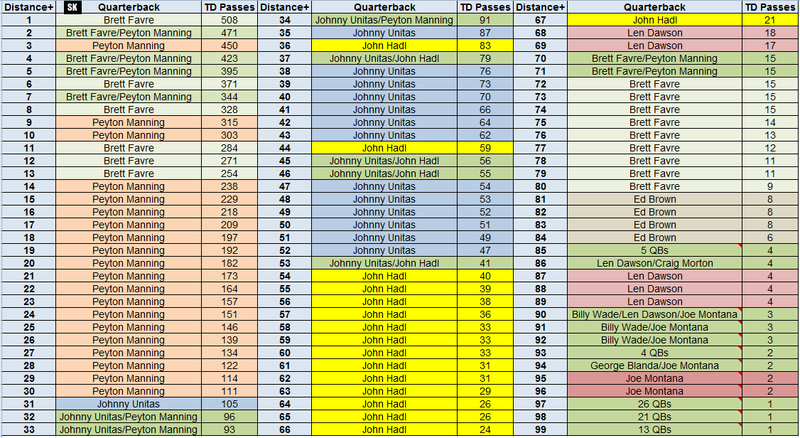 I also ranked each QB based on his team’s scoring averages: points for (PF) and points allowed (PA). These scoring numbers were not adjusted for return scores. Brady ranks well above average here in everything, but especially in regards to TD% and INT%. Where he’s not as impressive as some of his peers are completion percentage (13th) and the stat this table is built around, YPA (27th). Brady’s 7th in scoring, but he’s had the luxury of the 8th-best scoring defense here, which is true for most of the quarterbacks with a winning record. A guy that actually shows up very well here statistically is Andy Dalton (highest TD%, passer rating and team scoring average), but these numbers could use some opponent adjustments. Peyton Manning was a tenth away two Dallas QBs from having the highest completion percentage and highest YPA. Remember, these are all regular-season numbers. 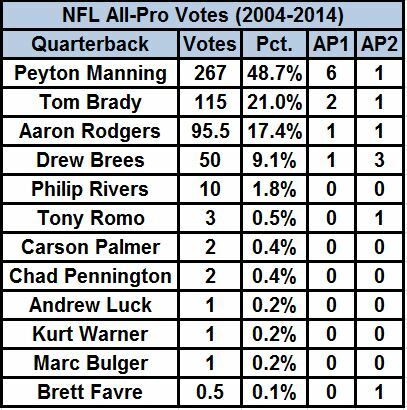 Including the playoffs would actually improve Brady’s record, because he somehow went 5-3 when averaging <=6.0 YPA. There’s the rub though. Brady started 5-0 in the playoffs when doing that, but since the 2007 season when the Patriots shifted to an offensive-first team, he’s 0-3 like you would expect from that low average. When the Patriots take on Kansas City on Monday night, which Brady will show up? A KC win would bring the Chiefs even in record with the Patriots and further add to the AFC’s mediocrity this season. It’s hard to imagine Brady not having his best game this month under the bright lights, but maybe we need to temper expectations for this 37-year-old quarterback. Maybe those dominant performances from 2007-2012 are a thing of the past. Maybe last year was the beginning of the end. All careers have to wind down and end eventually. Any previous matchup between a Tom Brady offense and an Alex Smith offense would be a no-brainer. But this week, it’s not so clear which quarterback is the one who struggles to stretch the field and must rely on his defense and running game. This is the closest in caliber Brady and Smith have been in their NFL careers. If that’s not cause for concern in New England, then I don’t know what is. But I like the Patriots this week, because I know this has never truly been a team that lives or die by its quarterback play. Bill Belichick versus Andy Reid is the real mismatch, and I expect The Hood to improve to 5-0 vs. Big Red. Bonus prediction: Brady will end his streak of games without multiple touchdown passes…barely. I screwed up my first Thursday pick after Kirk Cousins went full Buccaneer against the Giants. Not every defense plays like Jacksonville and Philadelphia. Cousins only has 341 official dropbacks in the regular season, but his turnover rate is 5.87 percent. How bad is that? Let’s just say Mark Sanchez (5.29%) and Rex Grossman (5.30%) think it’s too high to remain a starter in today’s NFL.